Create Your Own Hotspot Business with us! 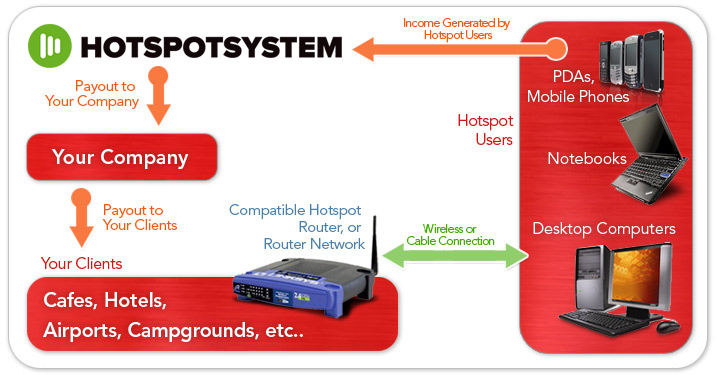 By becoming a HotspotSystem.com Partner, you have a unique business opportunity to increase your business revenue and service for your client base. You, as a reseller can provide hotspot solutions to your clients without having to operate servers, using our cloud based hosted solution. Our company gets contracted with you as a reseller. You get contracted with your clients (hotel chains, individual locations). In case you want to operate a Wi-Fi hotspot network which is free for end users (or have free locations in your network), there are different options. If you want to have a splash page only where users can log in by accepting the terms, enter an email, or log in with a supported Social Network (Facebook, Twitter), you can go with the Volume Plan which gives you a Basic/Social Plus license for all your locations. That gives you 30.000 sessions for the whole account (all locations). If you exceed the 30.000 session limit per operator, you can buy additional sessions any time, which can be used across all locations. Please note you need a different Volume License for Basic and Social locations. In case you need both solutions, you need to buy both licenses. Click here for pricing. In case you want to operate the free hotspot with Vouchers or SMS, you can buy vouchers/SMS options in bulk and distribute across all locations. You can find the Pay As You Go pricing here. If you are a White Label operator you can get 20% discount off these prices. You can ask for any fees from your partners of course, this is completely up to you. Besides the hotspot management service you can provide support or any other service for these places. You can bill them with your own fee which can include your own profit margin. We pay you 80% or more* of the end user income based on the revenue you generate with your locations. We pay you out monthly, then you'll pay out your clients. It is up to you how you share this amount with your clients. You can set up different business models, for example you can provide installation for a client and give them 50% and keep 30%. Or you can give them the router for free and keep all the income. There are several business models that can work with your business. * More than 80% payout rate is available for operators if the revenue exceeds 3000 USD/month. You need to request the rate change from us. We provide all tools you need to setup and operate your own Wi-Fi Hotspot business. You don't need to invest in expensive software or hardware, you just need our cloud-based solution to manage your hotspot network. Cloud-based Hotspot Management. You can start by creating a HotspotSystem.com Operator Account and register your first location. You can add your partner's locations under your own account and manage all locations from a centralized interface. All the location's information can be customized, you can create different access packages with different pricing, even in different currencies, upload a custom logo, etc. You can change this information any time remotely with just a few clicks. Secondary Operators. You can create and provide an account for the owner or an administrative person of a location, that we call 'secondary operator'. This operator can log in and see basic information like transactions and customers details so he/she can follow all activity. Secondary Operator will see information only for the locations that you add rights to, so he/she won't be able to access your other location's data. You can set different privilegies for each account, like whether the secondary operator is eligible to modify the voucher's printing layout or not, etc. Router Alert. We're monitoring your Hotspot routers 24/7 and alert you if something is wrong. With our Router Alert feature you can get e-mail alerts if a particular router is down or if the service is not operational so you can provide support immediately for the client. Roaming. By default Wi-Fi users can log in from every location within your network, but the system is capable of handle roaming in a very intelligent way. You can "isolate" a location if you don't want to allow users from other locations to be able to log in to that one. Or you can define a Roaming Location Group so only those users will able to log in from any location which is part of the group that purchased access in one of the locations within the group. Location Groups. You can create groups from your locations. Let's say you have a partner with a hotel chain so you may want to create a Location Group for that chain. This is useful for statistical purposes (make a report for that group instead of just for individual locations one by one), or it can be for defining a separate Roaming Group where wi-fi users can only roam between the locations of the group. Charts to Analyze your Sales. 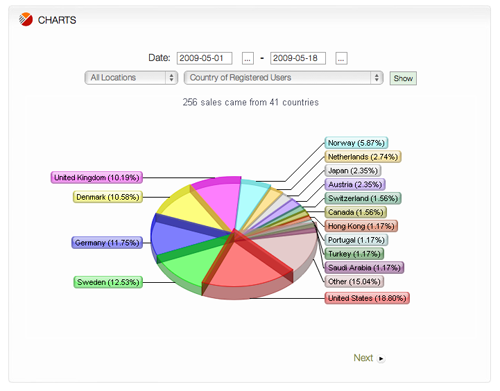 Check out the country or language of your Hotspot users and type of credit card they used. Compare the sales of your Hotspot locations and see which generated the most income. Complete Billing Solution. Our system comes with a complete billing solution, therefore you don't need merchant accounts to accept payments from Wi-Fi users. We process all transactions, handle refunds and chargebacks so you don't need to deal with that. We are using multiple payment processors to ensure stability and reliability. We support local payment methods too, like iDeal and directEbanking. All transaction fees are included in the commission you pay to us (except any chargeback fees). We summarize your earnings after each month and pay you out monthly. FAQ: When and how do I get paid? Accounting with your Partners. After we pay you out for all locations, you can create powerful reports so you can pay out your clients. 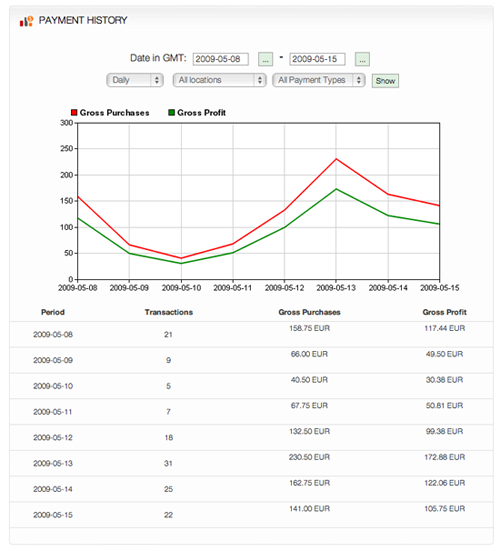 You can also export all transactions' details in a csv format to create your own custom report. Your partners can only see the revenues of their locations (and only if you give access for them to see this information), then you can pay them out based on the contract between you and your partner. More Features. You can download our Operator Guide to see all features of the Control Center, or you can check the main features of Hotspot PRO (pay-per-use) locations and Hotspot FREE locations. Support for Partners, Hotspot Users. We provide support for our operators via help desk system, email, phone and chat. End users and your local partners must contact directly to you via one of the contact methods shown on your splash page. Support Ticketing System. 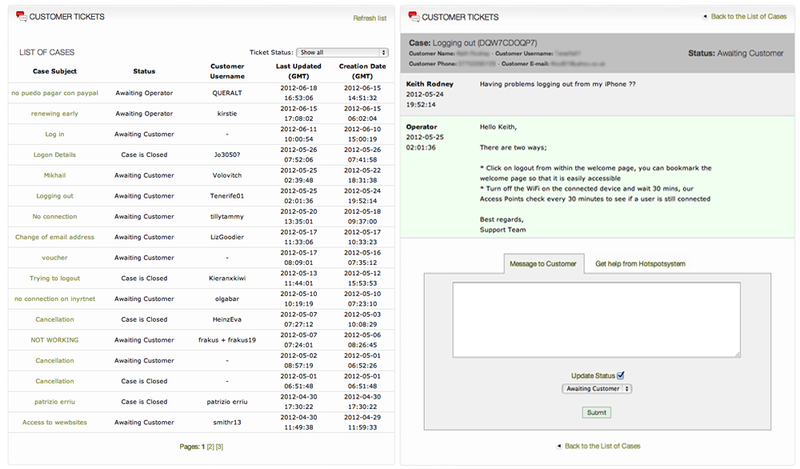 We provide a basic ticketing system so you can provide support for your customers efficiently. Your customers can fill out a form on your splash page and track your answers through a web address which they can view freely, even if they didn't purchase an access or couldn't get online (therefore they cannot access their emails to read your replies). You will get email alerts and can answer through the Control Center, or via email (which is also tracked by the ticketing system). You can offer the service to your clients as it was your own. You can use your own logos, layouts, the system can even run under your own domain name (White Label). Professional Looking Start Pages. There are built-in skins for Wi-Fi Splash pages you can use created by professional web designers. These use the latest technologies (f.e. AJAX) for realtime form validation to help your guests with the registration process. Each Skin is completely customizable. Upload your own Logos or Create a Unique Look. You can upload your logos, graphics, instructions, ads, etc into 3 different positions or you can insert any HTML code for further customization. Every location can have different looks/logos, etc. You can even use multi-language images for different languages! Use Your Own Splash Page (Walled Garden). 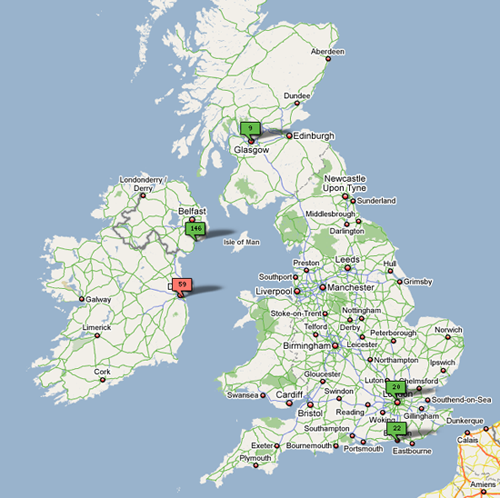 You can redirect users to your own start page where you can write important or relevant information about your location. Then you can link back to our payment pages where users can buy access. HotspotAdmin.com. Your secondary operators can log in using our "unbranded" site, hotspotadmin.com. You probably don't want your clients to contact us directly, this way you can hide our domain name. White Label. It is also possible to remove all HotSpotSystem.com related text and graphics from the Splash pages and replace it with your own branding. You can even use your own domain name so the service will look like as it is was your own. Please note that we will still host the files and the system, you just have to point your domain name (subdomain) to our servers using cname. FAQ: How can i remove your branding and use my own (including my domain name)? Please note that on the payment page and the users credit card statements our company name may appear as HotSpot System or HotSpot System Ltd. (but the domain name will be never visible). It is also possible to use your own merchant account in special cases. One of the most important things when you start or expand a business is to find a partner who you can trust. Hotspot System Ltd. (Company Reg#: 0109883187, EU Tax ID: HU13983981) is the hotspot division of Interpest LTD. which was established in 1996. After 10 years of experience in domain name registration and hosting, and over 5 years of experience in Wi-Fi technology, hardware and installation, a hotspot division was formed in 2005 to provide professional wireless hotspot solutions for those individuals and companies who would like to start their own hotspot service. Currently we have thousands of operators from all over the world, including USA, Australia, New Zealand and UK and from more than 100 other countries. We have developed one of the most flexible and versatile systems in the industry to have as an ideal solution for our business partners who would like to start their own hotspot business to provide wireless hotspot solutions for their local partners. 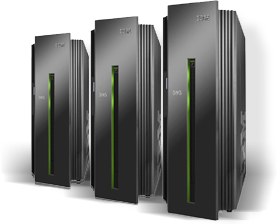 The system core is running on multiple high-end IBM servers. Each server has multi-core Intel Xeon processors, hot-swap power supplies and hot-swap SAS hard disks subsystem using RAID to increase redundancy and system stability. These servers provide the background for our web, database and radius servers. Servers are hosted in business data centers in Hungary, Washington, Singapore, Strasbourg, Frankfurt with redundant connections to international backbones with 24/7 monitoring and continuous backups. We are continously expanding our presence in foreign data centers because of the growing numbers of our international hotspot locations. Our payment system is connected to multiple payment processors and banks to provide seamless, secure and fast payments. Our primary payment processor is Adyen, a Dutch company which is formed by board members of the International Merchant Services division of the Royal Bank of Scotland (RBS). We can handle credit card payments in a variety of currencies, and can also handle local payment methods like iDeal and directEbanking. The secondary processor we are using is Worldpay, which first provided internet payment services in 1994, making it one of the first providers of such services in the world. Our third payment processor is PayPal which is optional. PayPal will make payments easier if the user has a PayPal account. This combination provides the most effective way to charge end users. While most of the hotspot companies are using PayPal only for credit card transactions, we have learned that PayPal cannot provide a complete solution for hotspot operators, because Paypal is not available for citizens of certain countries. Adding a regular credit card payment option to PayPal increases the sales by aprx. 30-40%. Please visit our knowledgebase article for more information. Should you have more questions, please visit our Help Desk!